This main course combines the savory taste of pork with sweet apples for classic complementary flavors. Heat an oven-safe saute pan over medium-high heat. Add the olive oil and tilt to coat the pan. 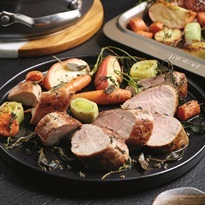 Season the pork tenderloin with salt and pepper on all sides and then add it to your saute pan. Sear it on all sides until brown. Add the carrots, apples, potatoes, and leek. Reduce the heat to medium and cook for 3 minutes, or until the vegetables have some color. Put the pan in the oven and let the pork and vegetables roast for 15 minutes. Remove the pork from pan and let it rest on a cutting board. Put the saute pan with vegetables and liquid back in oven for 3 minutes, or until the liquid is reduced and syrupy and the vegetables are well glazed. Slice the cooked pork and plate. Serve with the glazed vegetables and pour any remaining pan drippings over the meat.